Ludum Dare theme(s): “2-button controls” and “Growing”. Apparently there was a tie, and these two work pretty well together. This time around the team consists of me (jack of all trades), Mark (programmer)​, Chris (programmer/designer), Andrew (pixel artist), John (other artist)​, and possibly maybe Zachary​ if he has time to kick out some tunes. Definitely a full house, and I think we’ve picked an idea that will scale with a team this size pretty well. We spent last night after the reveal brainstorming and exploring different ideas, with the express intention of not writing a single line of code until this morning, after we’d made sure our idea was solid enough. Now that I’ve rebooted, I think the idea is quite solid, if a bit weak in the “growing” aspect. Still waiting for everyone to wake up, and I unfortunately have to run a shift today at work, but things are looking good so far. Now to toss together a dungeon, a waypoint system, and then start processing sprites en masse! Is anyone else having issues with imgur gifs becoming broken? I’ve had two posts now that seemed fine and dandy for the first five minutes of being up, but then suddenly decide that the image isn’t worth loading. Anyone else having this issue? Finally feels like I’m getting somewhere (with 16 hours to go, I should hope so). Here you can see the unit interactions of my RTS-lite dungeon keeping game. The wolf pups all aggro on their own and nibble the pathetic Knight to death. For great justice. If for some reason the gif above isn’t loading on this site (I had that earlier), you can see it here. As you can see, the unit selection/movement is also working (though the selection glow is bugged for some reason and only shows up when it feels like it). Next I need to throw together a dungeon, then a simple pathing system for invading heroes, configure the prefabs for the remaining units/buildings, and baby, you got a stew going. So, I can place buildings, I can spawn creatures. The deadline is looming, but hopefully these last 24 hours will be my most productive. I think something at least resembling a game will come out of this. As Deepak Chopra taught us, quantum physics means anything can happen at any time for no reason. Also, eat plenty of oatmeal and animals never had a war. Who’s the real animals? Progress! So my game is going to be an RTS-lite, in the setting of a Zelda-esque top-down action title. You are the middle management hired to bring a standard evil dungeon up to profitability, mostly by keeping those pesky heroes from constantly liberating all of your–excuse me, your new boss’s–various magical MacGuffins. You must manage your resources, keep your minions employees from going on strike, and, of course, eliminate would-be heroes with great prejudice. Here you can see the tile detection chugging along; you’ll be able to put some traps or generators on the ground, and other traps embedded in the walls. Also shown is one of the fantastic LPC Sprites controlled with wasd, courtesy of Open Game Art. So yeah. I’m real optimistic, just have to keep chugging along. Last time I worked on Ludum Dare, I ran with the first idea that seemed workable, and it wasn’t until halfway through that I realized it was a dumb idea, somehow both too lofty and too lazy. This time I discussed my idea thoroughly with several friends individually last night, typed up some ideas, and then slept on it. Now that I’m awake, the idea still seems sound, and I’m much more confident that I can have something possible and working done by Monday. After poking around, I found OpenGameArt’s LPC project to be most helpful for most of the art I’m going to need for my 2D Zelda-esque dungeon crawler. One major set of setpieces are the bosses, though; your standard dungeon fare: dragons, ogres, necromancers, etc, and I don’t have time to work on them myself and no artist attached to this project yet. Anyone willing to help on this aspect? Perhaps one of you artists that can’t put in as much time as they’d like? So a lot of people, from a quick glance at other blogs, seem to be taking this from a more philosophical perspective. You, the knight in shining armour, are such a piece of crap for killing all those defenseless monsters. Doctor Frankenstein is the real monster, guys! K, this works for some things. Not for a 72 hour jam, I think. If you’ve got a good story you want to tell, then by all means, but there’s not much room to write a story, much less develop one here. So I’m going to interpret “monster” as “mook” or “minion”. Goombas are monsters, the Covenant are monsters, all those things you end up killing in games are the “monsters” that now You are. I’m thinking of building a dungeon-crawling roguelike in reverse–no fancy shmancy plot twists here, you’re just the boss waiting for the hero to finish killing everything, and so you’re throwing monsters at him at key points to soften him up before your climactic battle. 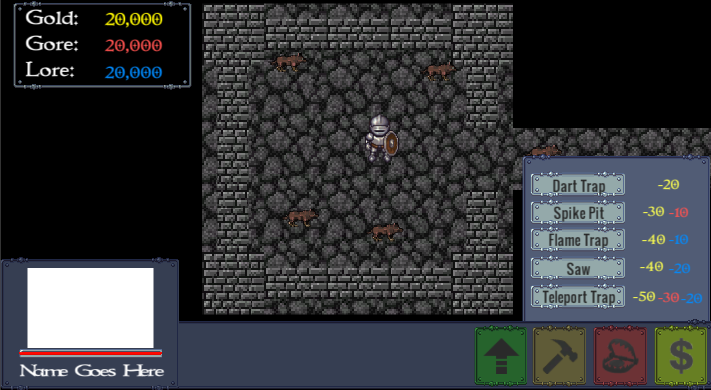 I’m thinking Zelda meets Nethack meets Boss Monster–or should I say Ganon meets Moloch meets Boss Monster? Finally have an idea that’s approachable, I think. My first idea was basically Metal Slug meets Hello Kitty; think a big burly military sidescrolling shooter, using teddy bears and rainbows to distract rather than kill your enemy. I was going to combine the cutsey part with nonstandard shooting style, a two-for-two under the “unconventional weapon” part. It bugs me when themes like this are chosen; rather than informing the mechanics they inform the aesthetics; can anyone make a game using this theme with just boxes and spheres? It’d be pretty difficult, I think, because for something to be unconventional it has to break conventions, and with “weapon” being in the theme that means “build a combat-based game and replace the sword with a spoon” or something similar. Well, anyway, vent over. I set a timer for five minutes and thought about the theme and how it could be interpreted. Thinking about “unconventional”, it occurred to me that there’s a few different ways to look at something being called “unconventional”: it could mean something unrelated being introduced to a process (spoon for sword), or, it could mean using something way out of its own context (using a sword on a cooking show). So we submitted Snowman’s Revenge yesterday but haven’t actually heard from anyone that’s beaten it. I know for a fact that at least two people have made it to 5 o’clock (the game ends at 6), but has anyone actually made it further? One whole internet to the person that does! Like what you see? Check out the game here! Snowman’s Revenge is finally finished! Throw snowballs to make vengeful snowmen explode. Page is up here. I’m surprised we got as much in as we did. If we could do it over again, we’d probably get a basic version of the gameplay done first, as we really did spend too much time on the art, etc. It came out alright, though. Maybe it’s a bit hard, but what’s wrong with that? Anyway, feedback is totally welcome, we’d love to hear what people think. It’s even better with all the sounds! Seriously looking forward to releasing it tomorrow for everyone to try. Follow @teltura for more updates as they come! Here we can see everything shaping up. Just need to put in win/loss, transitions, GUI, audio, and snowman death, and it’s all ready to start balancing. Most of these items are already partially started, so it’s just putting things where they need to go. My partner has all the manual controls working as far as changing lights and firing snowballs, and I’ve been getting the snowman spawning and running/hiding working. Will you be able to defend yourself from the onslaught? Kinda glad we’re entering the Jam. We’ll probably be mostly done today, but it’s nice having a whole day to fix things if they come up. 22 queries executed in 0.104 seconds.